Witchcraft was not made a capital offence in Britain until 1563 although it was deemed heresy and was denounced as such by Pope Innocent VIII in 1484. 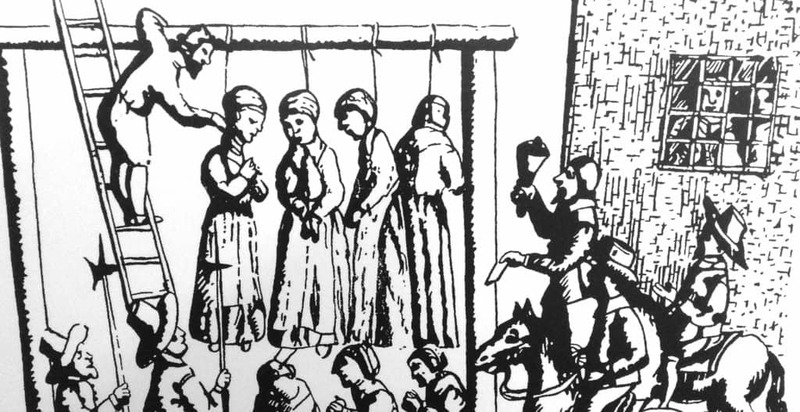 From 1484 until around 1750 some 200,000 witches were tortured, burnt or hanged in Western Europe. Most supposed witches were usually old women, and invariably poor. Any who were unfortunate enough to be ‘crone-like’, snaggle-toothed, sunken cheeked and having a hairy lip were assumed to possess the ‘Evil Eye’ ! If they also had a cat this was taken a proof, as witches always had a ‘familiar’, the cat being the most common. Many unfortunate women were condemned on this sort of evidence and hanged after undergoing appalling torture. The ‘pilnie-winks’ (thumb screws) and iron ‘caspie-claws’ (a form of leg irons heated over a brazier) usually got a confession from the supposed witch. Witch fever gripped East Anglia for 14 terrible months between 1645 – 1646. The people of these eastern counties were solidly Puritan and rabid anti-Catholics and easily swayed by bigoted preachers whose mission was to seek out the slightest whiff of heresy. A man called Matthew Hopkins, an unsuccessful lawyer, came to help (!) He became known as the ‘Witchfinder General’ . He had 68 people put to death in Bury St. Edmunds alone, and 19 hanged at Chelmsford in a single day. After Chelmsford he set off for Norfolk and Suffolk. Aldeburgh paid him £6 for clearing the town of witches, Kings Lynn £15 and a grateful Stowmarket £23. This was at a time when the daily wage was 2.5p. A heart carved on a wall in the market place at Kings Lynn is supposed to mark the spot where the heart of Margaret Read, a condemned witch who was being burnt at the stake, leapt from the flames and struck the wall. Much of Matthew Hopkins theories of deduction were based on Devils Marks. A wart or mole or even a flea-bite he took to be a Devils Mark and he used his ‘jabbing needle’ to see if these marks were insensitive to pain. His ‘needle’ was a 3 inch long spike which retracted into the spring-loaded handle so the unfortunate woman never felt any pain. There were other tests for witches. Mary Sutton of Bedford was put to the swimming test. With her thumbs tied to opposite big toes she was flung into the river. If she floated she was guilty, if she sank, innocent. Poor Mary floated! A last reminder of Hopkins’ reign of terror was discovered in St. Osyth, Essex, in 1921. Two female skeletons were found in a garden, pinned into unmarked graves and with iron rivets driven through their joints. This was to make sure a witch could not return from the grave. Hopkins was responsible for over 300 executions. Mother Shipton is remembered still in Knaresborough, Yorkshire. Although called a witch, she is more famous for her predictions about the future. She apparently foresaw cars, trains, planes and the telegraph. Her cave and the Dripping Well , where objects hung under the dripping water become like stone, are a popular site to visit today in Knaresborough. In August 1612, the Pendle Witches, three generations of one family, were marched through the crowded streets of Lancaster and hanged. Though many of the Acts against witchcraft were repealed in 1736, witch hunting still went on. In 1863, an alleged male witch was drowned in a pond in Headingham, Essex and in 1945 the body of an elderly farm labourer was found near the village of Meon Hill in Warwickshire. 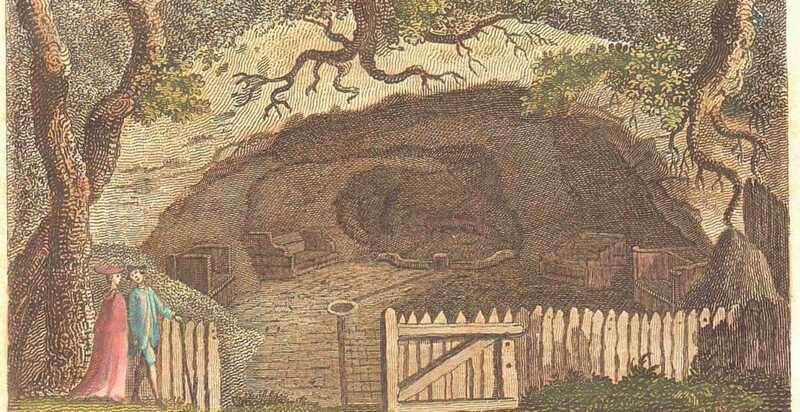 His throat had been cut and his corpse was pinned to the earth with a pitchfork. The murder remains unsolved, however the man was reputed, locally, to be a wizard. It seems that belief in witchcraft has not entirely died out.